Early mornings really aren't my thing, but sometimes the allure of a beautiful sunrise and birdwatching can coax me out of bed while it's still dark. This was one such morning. I headed to Scarborough Marsh to capture the first rays of light over the waters. I must say it was well worth it. The colors were slow to come out as the sun climbed above the horizon and the clouds out at sea. However, soon the the sky was filled with breathtaking color being reflected in the still back waters of the marsh. Soon it was light enough to take in the birds out at the early hour. A group of greater yellow legs were seeking their breakfast. 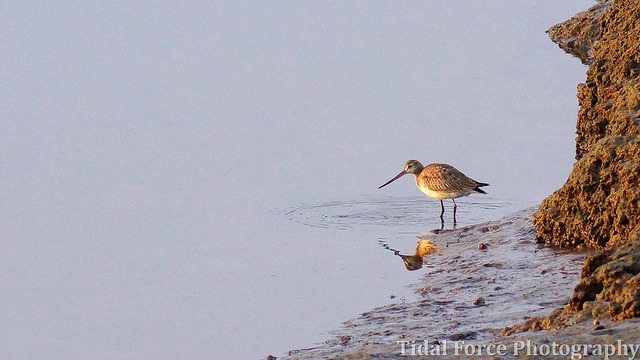 On the other side of the trail, a traveling hudsonian godwit was also out looking for a meal.